We LOVE our light table. 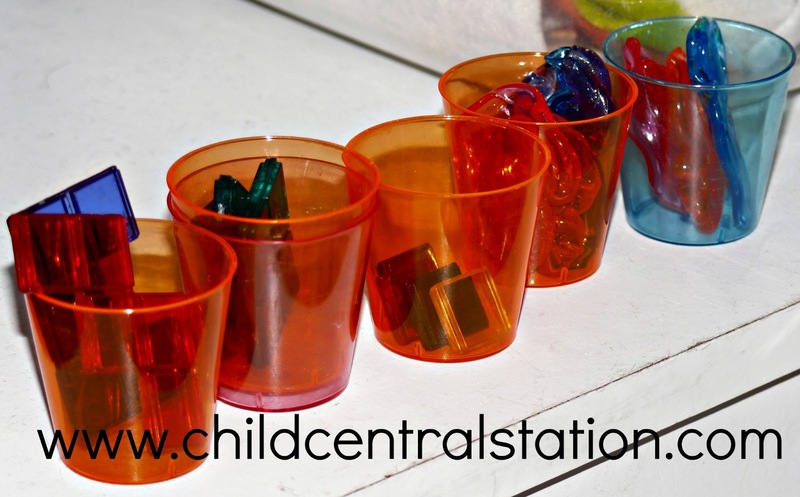 Like many things, children's interest in exploring on our light table tends to vary. 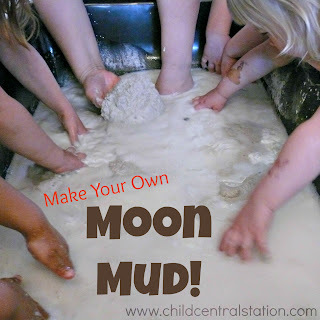 For weeks we will play and explore, then for awhile, it seems to be "old news" and sits upon our shelf until a child shows interest or we find something else to add to our exploration. 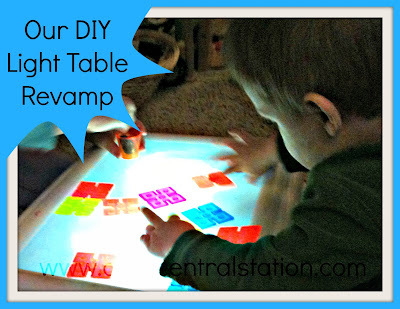 Recently, our original DIY light table went ca-putz! (Well, the light burnt out). Our original table was made with an under the counter light fixture, and the table needed to be plugged in. We had the option of buying a new light bulb or trying out different lights. After careful consideration, we decided to add new lights to our table. We decided to try some LED touch lights- first because we wanted to make our table more portable, and second they were less expensive than a new bulb for our light fixture. I have a free handout on how to make this table (and a sensory table that you can download here). I have also found everything you need to make a table for you! You can choose between the under the cabinet light fixture or the LED lights! "Look Ms. Amy- it's my letter- M!" Game pieces from Blokus are great on the light table too. sorting materials and stacking on the light table. 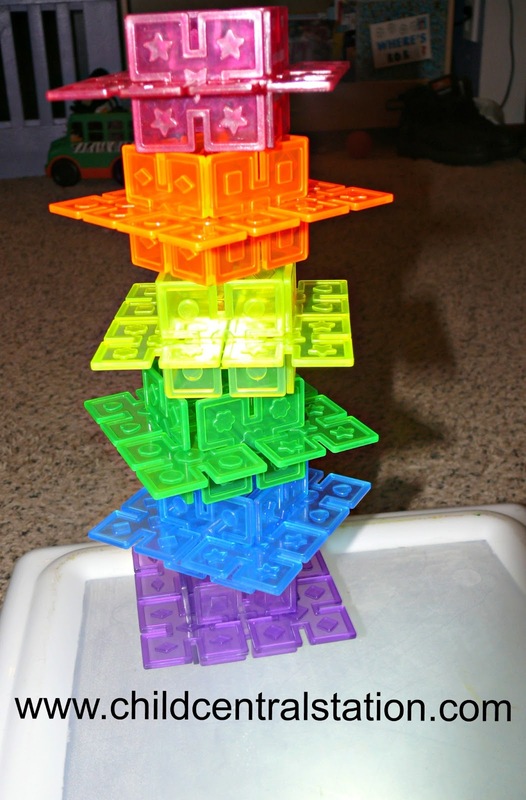 Interlox and/or Magnatiles are some of our favorite building blocks on the light table. 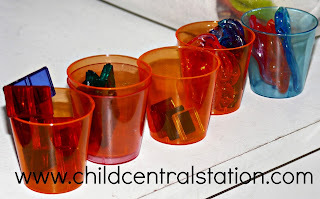 We have also used xrays, bugs, slides, geometric solids, tangram shapes, jars with colored water.... on our light table. 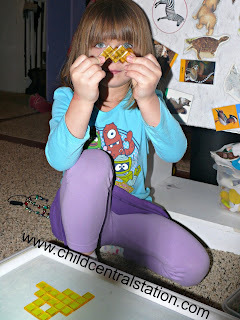 What are your favorite things to use on the light table? Translucent duplo blocks have been our favorite on our homemade light table. Great idea! I've been looking for a DIY light table that wasn't too hard to put together. I am wondering which lights you prefer now that you have tried both the under counter and the LEDs? Which ones seem to light the box better? I just thought that maybe the LEDs wouldn't give the box enough light. And with the LEDs, are there certain ones you would recommend? I actually really like the LED lights much better than the under the counter light. It is not as bright, but I think that is better. I think that the under the counter light was a little bit overpowering at times. I also love the portability of the LED lights! I have only used the ones I ordered from Amazon (shown in the carousel above) and we love them! It is nice to have the kind you can replace the batteries! How do you attach the led lights?